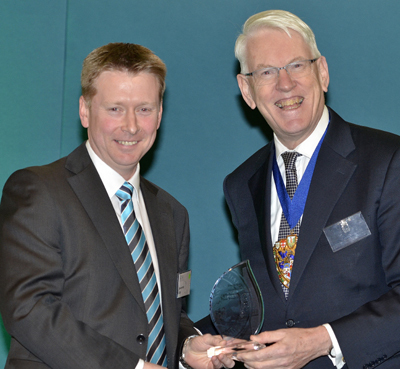 Darren Kelly ACSI of the Isle of Man was one of an elite group of 96 award winners at the Chartered Institute for Securities & Investment (CISI) Annual Award ceremony at Mansion House, London. The Awards are made every year for top exam performers and Darren joined prize winners from India, the UAE, Singapore, Bahrain, Lebanon, Qatar, Republic of Ireland and France. Awards were given in 54 categories with the winners being selected from takers of nearly 37,000 exams in 74 countries. Darren Kelly ACSI of Isle of Man receiving his award from Sir David Howard FCSI(Hon), Chairman and Managing Director, Charles Stanley & Co Ltd.
Darren received his CISI Level 3 Award in Global Financial Compliance from Sir David Howard FCSI(Hon), Chairman, CISI Examination Board. The CISI has 300 members in its Isle of Man branch and organises regular continuing professional development networking events and workshops. Forthcoming events include the branch Annual Dinner 24 October.